The fifth book in Tundra's Great Idea Series, Making Contact! tells the story of Guglielmo Marconi, who became the father of wireless communication. As a boy, Marconi loved science and invention. Born in 1874 in Bologna, Italy, to a wealthy family, Marconi grew up surrounded by books in his father's library. He was fascinated with radio waves and learned Morse code, the language of the telegraph. A retired telegraph operator taught him how to tap messages on the telegraph machine. At the age of twenty, Marconi realized that no one had invented a wireless telegraph. 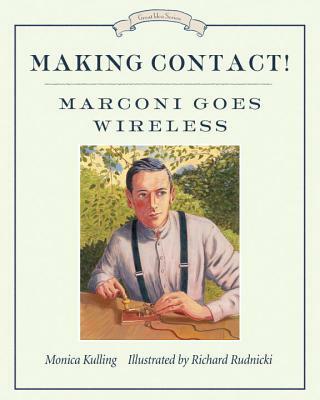 Determined to find a way to use radio waves to send wireless messages, Marconi found his calling. And, thanks to his persistence, on December 12, 1901, for the first time ever, a wireless signal traveled between two continents. The rest is history. Monica Kulling's playful, informative text, combined with the compelling illustrations of artist Richard Rudnicki, bring an amazing inventor and his times to life. Critically acclaimed author Monica Kulling has published over thirty-five books for children, including In the Bag! Margaret Knight Wraps It Up and Going Up! Elisha Otis's Trip to the Top, illustrated by David Parkins. The third book in Tundra's Great Idea Series, In the Bag! was selected by Smithsonian magazine as one of Ten Great Science Books for Kids. Her other two books in the series, It's a Snap! George Eastman's First Photograph and All Aboard! Elijah McCoy's Steam Engine, both illustrated by Bill Slavin, were also nominated for several awards. It's a Snap! was selected as One of the Year's Best Nonfiction Picture Books by Resource Links, and All Aboard! was a finalist for the Book of the Year Award - Juvenile Nonfiction by ForeWord Reviews. Monica Kulling is also the author of the hilarious Merci Mister Dash! and Mister Dash and the Cupcake Calamity. Visit her website at www.monicakulling.ca. The author lives in Toronto, Canada. Richard Rudnicki was born in Saskatchewan, but has lived in Nova Scotia for the past thirty-six years. He studied commercial art and graphic design before returning to his real love: drawing and painting. He has illustrated several books for children, including A Christmas Dollhouse; I Spy a Bunny; Gracie, the Public Gardens Duck; and Viola Desmond Won't Be Budged. He gives workshops in painting and drawing and shares a studio with his artist wife, Susan Tooke.